There are some designs and motifs that lend themselves to quilting quite easily. 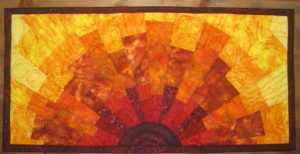 Making sun art quilts is one of those designs. 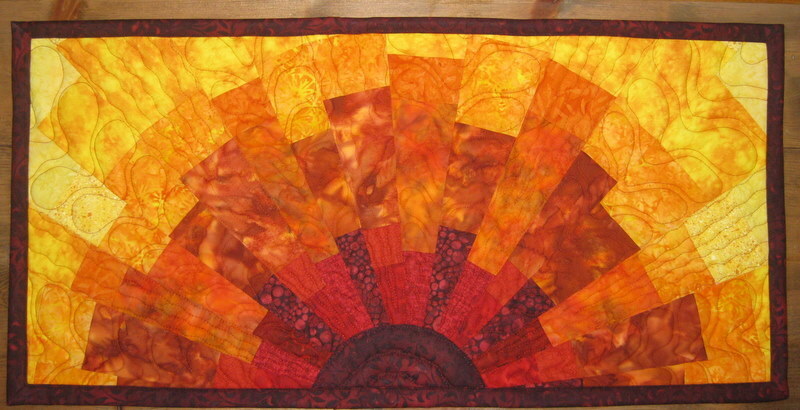 I have made quilts with dark colors for the sun and the colors lightening as they radiate from the sun. I’ve made them with light yellows for the sun and a lighter to darker color progression. 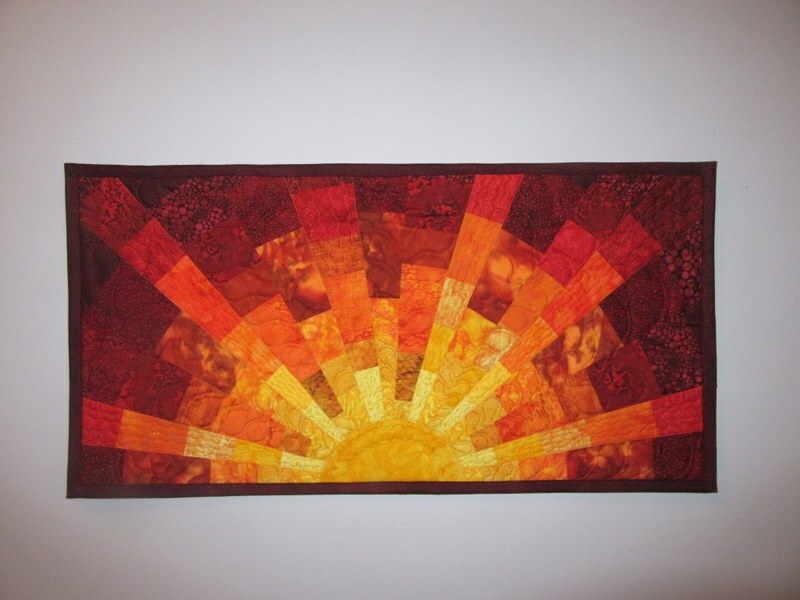 I want to make my next Sunburst or Blocky Sun art quilt with colors not at all related to those we typically think of as the sun…try something completely different! 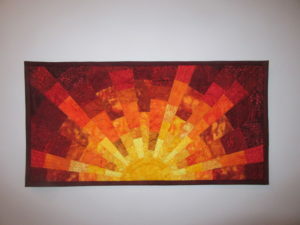 I recently made a new Sunburst quilt, shown in the upper left of this blog, which included some unexpected colors and much more detailed piecing than in my previous sun art quilts. I always start with a size in mind but this one got away from fairly early in the design and creation process. Since size doesn’t really matter unless I’m working on a custom quilt for someone, I just went with it. 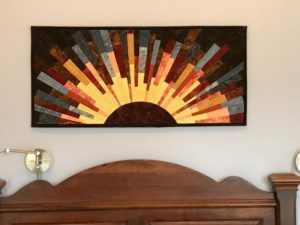 The quilt ended up being 21″H x 45″W. This was a perfect size for over the headboard of queen size bed or a regular size sofa. The unusual colors were some grays, peaches, rusts, maroons and browns. The grays were more towards the blue gray color scheme too. I just loved the final result! I cut much more narrow strips so there were about 40 rays instead of 18-20 in my previous designs. A Sunburst I made last year is shown with the wider ray pieces and a yellow gold center radiating into darker reds with oranges and rusts along the way. This one is shown in the upper right of the blog. 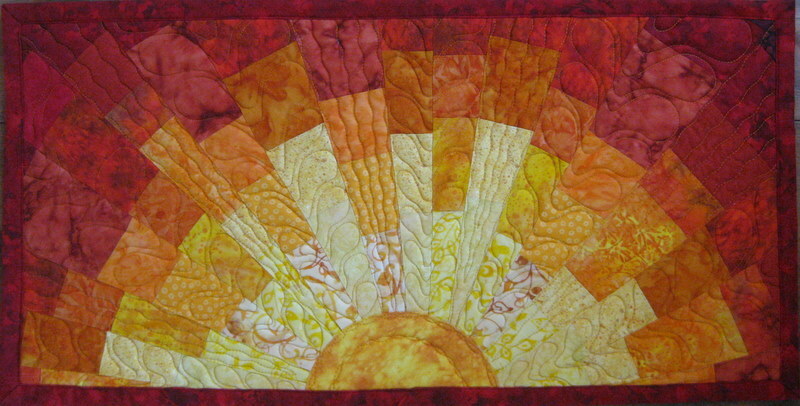 Several other Sunburst quilts are also pictured in this blog. I blogged about how I make these quilts in an earlier blog – Sept 1, 2015. These designs look simple but since I don’t use patterns (and I’m not the best note taker to remember exactly what I did the last time!) there is an element of the unknown when creating the designs. I do a lot of looking back at a previous quilt to reacquaint myself with what worked. These sun designs really need a good look from afar to determine if the colors are working and the design is what you want. I’m aiming for a planned randomness so that sewing lines of pieces in each ray do not meet with the rays on either side. This sometimes requires re-piecing with a longer or shorter section. This is an abstract design which does not have any curves in it except the sun at the bottom. 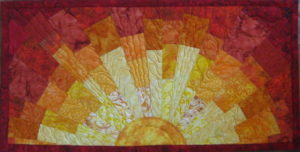 I piece the sun in but you could do a fusible applique for the sun and topstitch around the edge. I’m looking forward to trying new color combinations.